It’s hard not to get excited about this book. It’s hard not to fall in love with it. 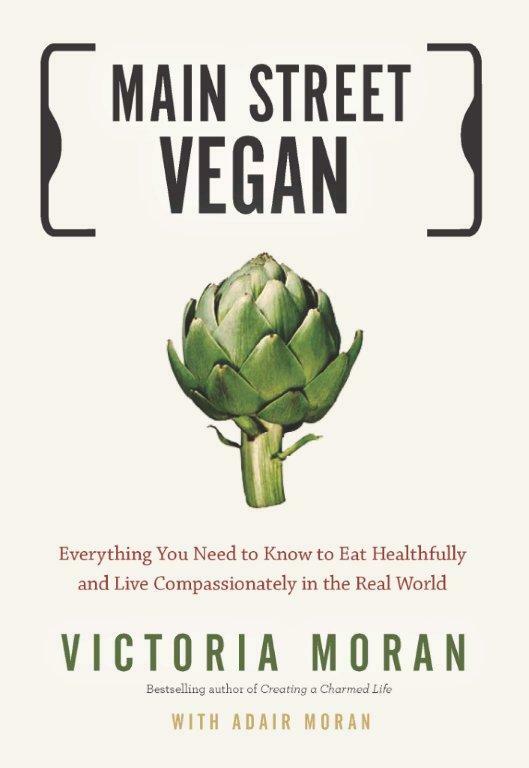 Victoria Moran’s latest book, titled Main Street Vegan – Everything You Need to Know to Eat Healthfully and Live Compassionately in the Real World, is sure to be a winner. We were excited by innovations such as the chapter on finding the method of switching over to a vegan diet that works best for you, rather than the usual one way fits all. “Vegan one day at a time”, “vegan one food at a time” and “vegan at home” are just a few of the strategies offered by the author for the reader to choose from. There’s even a “vegetarian for now” strategy for those just getting started on the veg journey who haven’t reached vegetarian yet. Also exciting is the forthright way the author confronts the myths and misinformation that abounds about some foods, such as the false fears being spread by the soy bashers and the false promotion of unique health benefits of fish. She doesn’t shy away from such real world considerations such as fitting vegan food choices comfortably into your budget, and she is not afraid to make specific recommendations and evaluations about specific brands of foods and other products which are so helpful to those just starting out. We loved the way Victoria wrote the book for real people and what it takes to switch over to the vegan way, in uniquely human terms. “To become a Main Street Vegan yourself”, says the author, “you’ll call on your courage, your flexibility, your sense of adventure, your willingness to learn, and your ability to rise to a challenge.” We loved the way she wrote in a personal style instead of “to whom it may concern,” the impersonal tone found in so many other books today. Victoria gets up close and personal, revealing her own switch over to vegan which did so much to help her in her own weight loss struggles. We also loved the recipes, arranged throughout the book, that use everyday ingredients but yield especially delicious dishes of every kind. In short, this book is a treasure trove that will reward the reader with one gem after the other, and we recommend it wholeheartedly. Victoria Moran is an author, motivational speaker, corporate spokesperson, and certified holistic health counselor (HHC, AADA). Her latest project, Main Street Vegan is published by Tarcher/Penguin and has been endorsed by such luminaries as Russell Simmons, Moby, and authorities such as Neal Barnard MD, president of the Physicians Committee for Responsible Medicine. Among Victoria’s ten additional titles are the best-selling Creating a Charmed Life (in thirty languages), and the plant-based weight-loss classic, The Love-Powered Diet: Eating for Freedom, Health, & Joy. A vegan for twenty-eight years, Victoria wrote Compassion, the Ultimate Ethic, the first book on vegan philosophy ever published by a major publisher, as her college thesis in 1985.